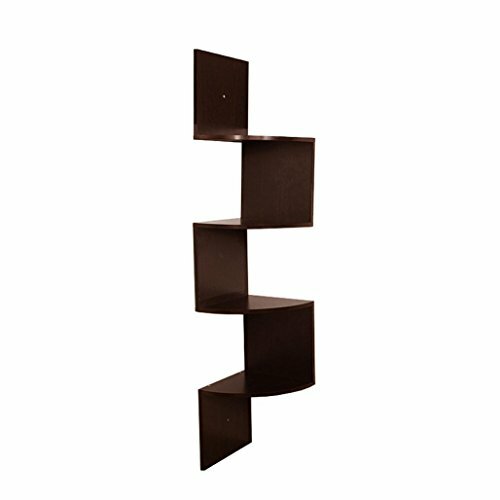 Floating corner shelves are not only practical but also attractive. And with the creatives designs that are out there you can find one that suits your style and decor. 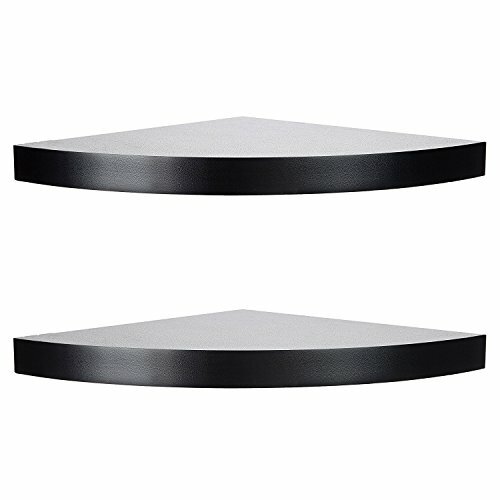 You can find these floating shelves in plastic or metal. 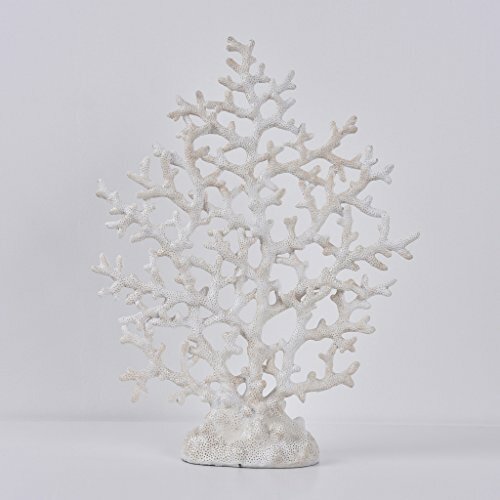 Some of them can be used for bookshelves or just to display your plants. 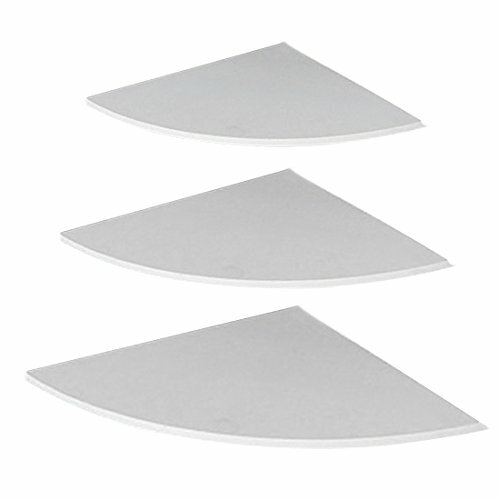 Many times they come included with their own specific way of attaching to the wall. In other cases you're directed to use common household tools to do the job. 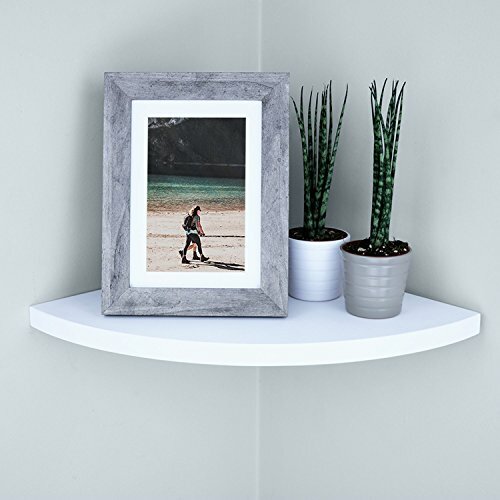 But make sure you also consider the weight bearing of your corner shelf so as to avoid any future damage to your wall or anything placed on your shelf. You can also find corner shower shelves on our site as well. 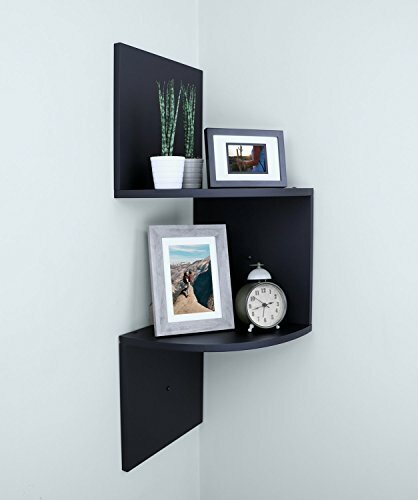 This modern floating corner shelf wall is made of mdf wood. some assembly is required. 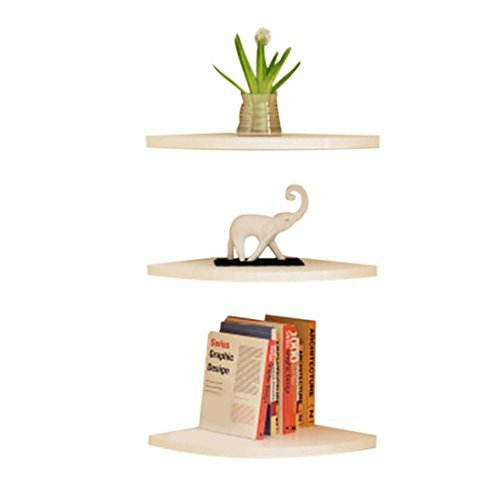 The wall corner shelf bathroom is elegant yet functional, making the modern corner shelf a great fit for a contemporary home decor. With three tiers and a small drawer on the bottom shelf, the corner mount shelf is a great place to store collectibles, earrings, and other personal items. 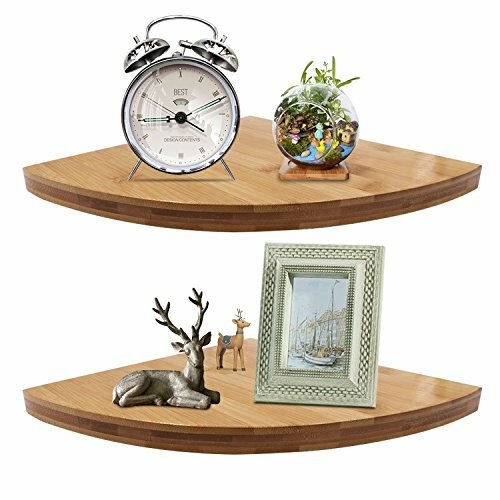 Floating corner shelves come in many sizes and shapes. 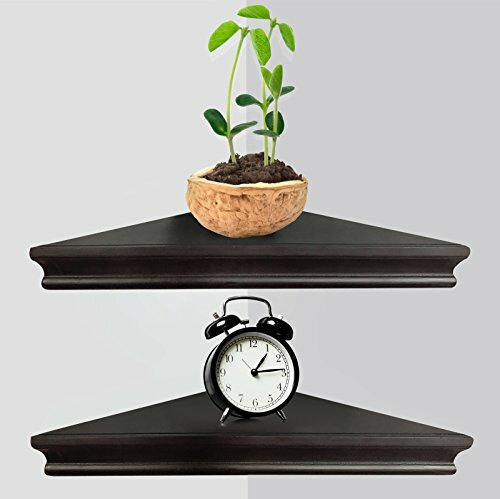 And with the many styles and imaginings of interior decorators, one can find always find floating shelf that fits the bill. 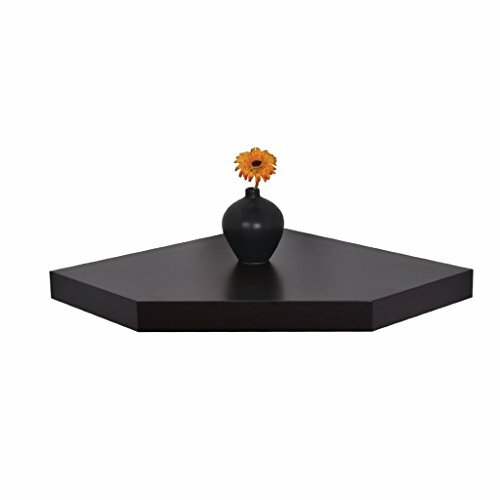 Buy why a floating corner shelf? Wouldn't a corner shelf do the trick? It depends on what you want to accomplish. Corner shelves also are attractive and practical. Some use their corner units for books, plants, art pieces, childrens' crafts, etc. 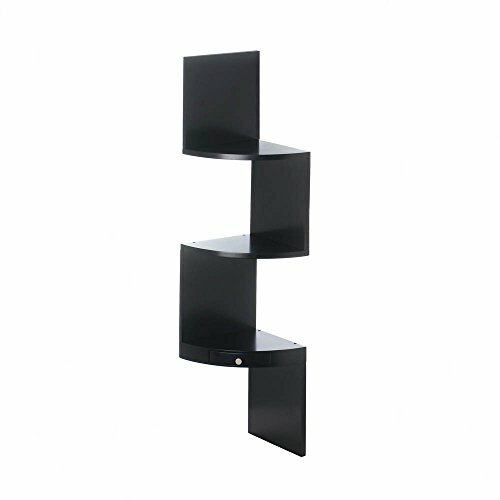 And these standing corner shelves can be tall or short depending on one's needs. 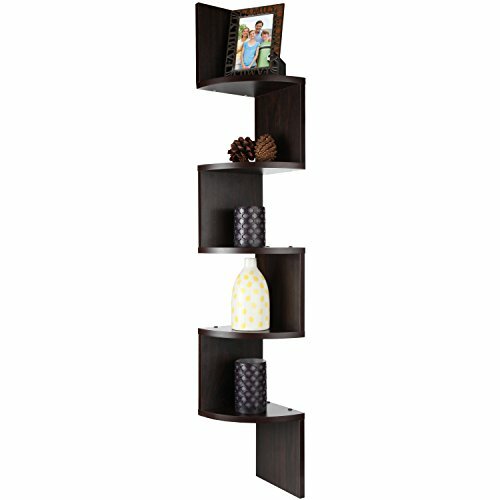 Some seek out large corner standing shelves to adorn their corner with artistic pieces. Whereas you may even find some sturdy enough and accessible enough for their agile cats. 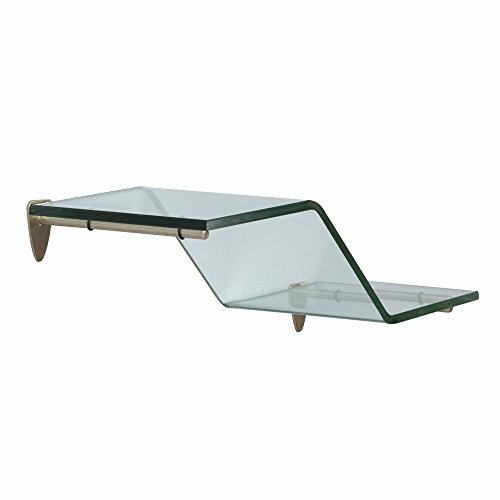 But even thought the needs of those seeking floating corner shelves may be similar the avant garde aspect of these corner floaters allows these needs to be met with an amazing style. The beauty of these floating shelves lies mostly in the 1) visual effect and the 2) space it saves. 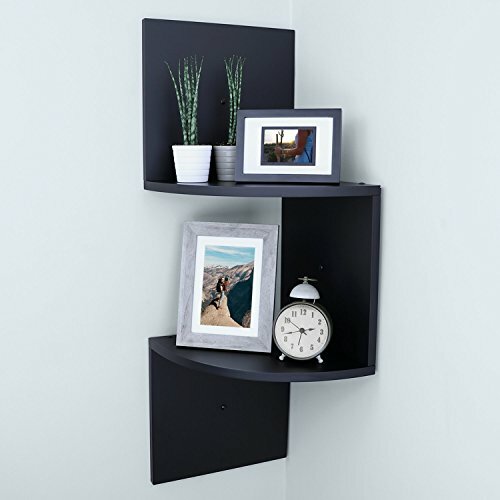 A wall mounted corner shelf can have a striking look. It's almost like an art piece, but can coupled with traditional finishes like dark wood or distressed looks which really can set a corner apart from other niches. 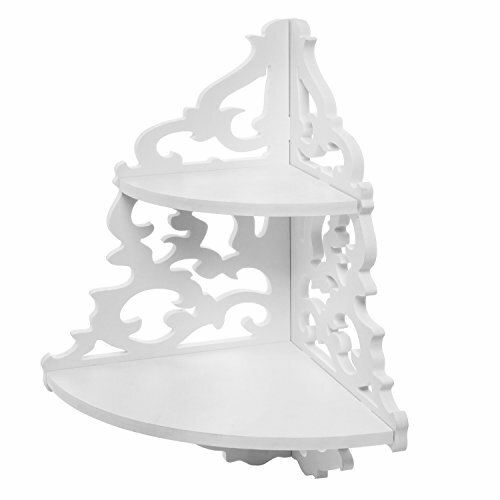 Imagine a dark corner back drop white with shiny white corner shelves. Or a white corner with silver floating shelves. And if you have the flair for the dramatic you can buy naked wood corner shelves and give it a very bright color. 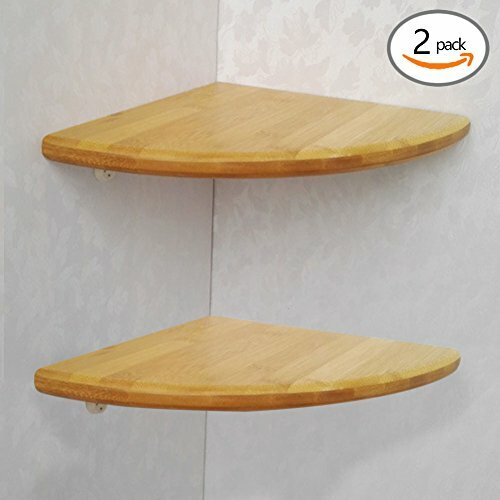 Any feature that makes floating corner shelves a great option is that it gives back the "air space" from standing corner shelves. What some have done with this reclaimed space is that they have places plants, small trees, corner cabinets, corner shoe racks and more under their floating shelves. Some have even added a corner sofa in that space as well. 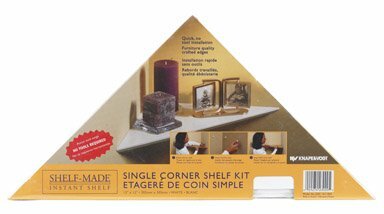 These unique corner shelf methods can have so many uses. 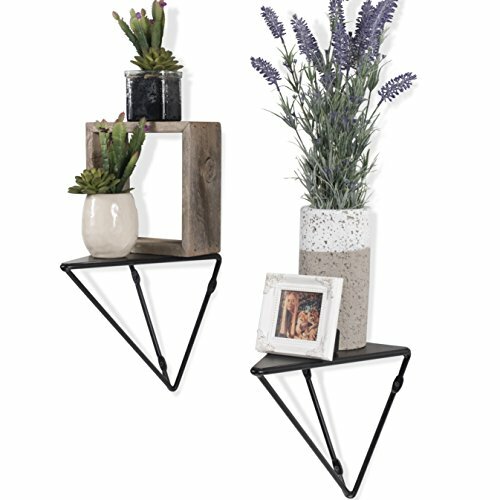 Some use them for picture frames and plants. Some can be used to hold books or art. You can use these floating shelves to hold a corner lamp (and creatively run wires down that wall in an artsy way) or even decorate them with hanging vines. 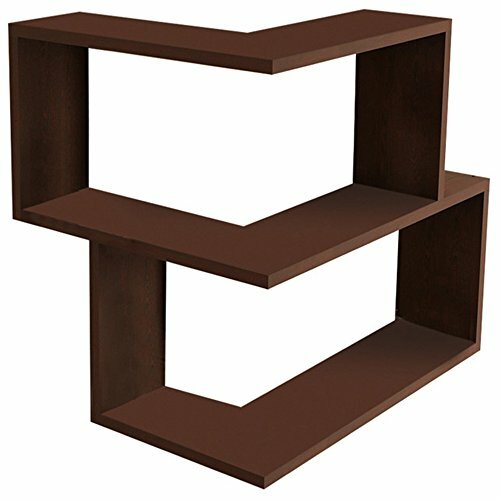 Whether it's a wood corner shelf or plastic shelf (depending on weight capacity) one can also uses them as a corner shelf storage rack. 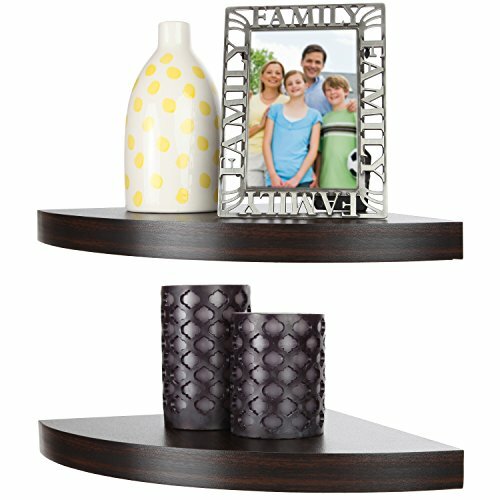 And floating corner shelf units aren't only for the living room or the bedroom. 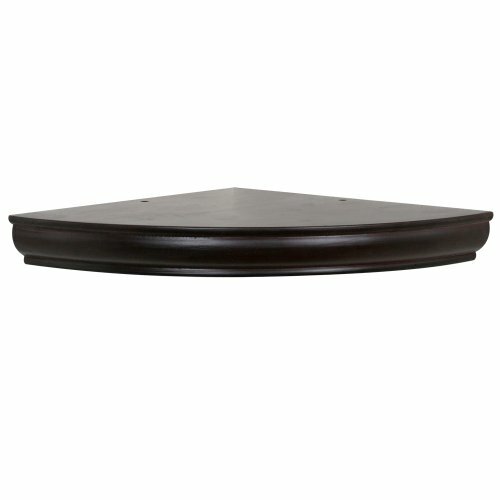 There are a plethora of floating corner shelves for bathrooms as well. So, you see, a corner shelf unit can have so many uses. 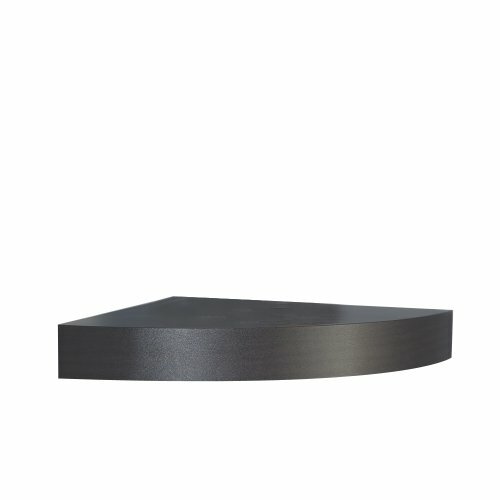 Because of the diversity of styles and manufacturers, there are many different to install floating corner shelves. Some of the come with braces and wall attachment pieces along with detailed instructions. Some may need you to purchase hardware items for the installation. 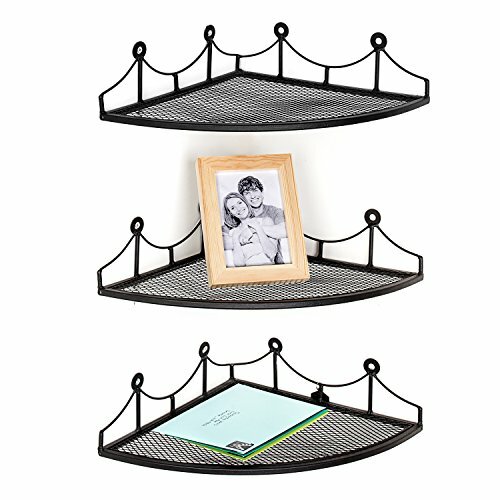 A do it yourself floating corner shelf project can be a fun project to jump into. You can make your shelf out of wood, metal, plastic, cardboard or even 3D printer cut. When you do it yourself you have the ability to style it and even color it to your fancy. Depending on where you get your specs from, see if you can also determine the load weight limits so that nothing too heavy to bear can be placed on it. Or you can even add strengthening factors to your corner piece if you want to add something that is heavier if the original weight bearing limit is too small. Hopefully from this you see the practical, creative beauty of floating corner shelves. Feel free to peruse our curated products and no doubt, you will find a corner piece that suits your style and tastes.